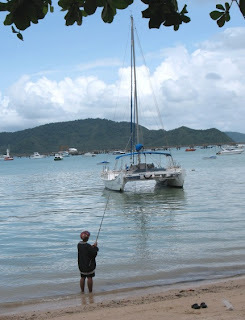 I make comments sometimes like - "I bet you're glad you came to Phuket in the low season!" - very true if you were here during the last 2 weeks. Great weather. Damn, better than high season and bargain hotels to boot! But of course there has to be some rain unless you want to holiday in the Atacama desert. My take is this - there is more rain in low season than high season, but it will not normally stop you enjoying a trip to Phuket. So pity my friend who I have not seen for about 10 years... in Bangkok for work but had the weekend free, so flew down to Phuket yesterday afternoon. And landed in a white out. Wet Wet Wet. Yesterday was one of the wet ones. If you come for 2 weeks, no way you'll get rain for your whole trip. If you come for 2 days, you might be unlucky. So today the weather has played games with us. We managed to get some sun, picked up my friend from the Amari Coral Beach Resort in Patong (we had to walk around for 15 minutes to find her - I have never had such a good look around this hotel before.. nice! ), we drove through Karon and Kata and went for lunch at Kan Eang Seafood. Still sunny, and we fed ourselves very well! 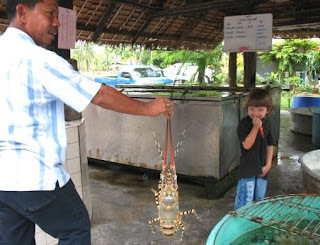 (above) My son scared by huge lobster - we did not eat him. The lobster I mean. We did not eat my son either.